July 1st delivered just as we all expected. Free agents from far and wide signed deals left and right. And just like that, #55 was gone. It took all but 16 minutes for Sergei's agent JP Barry to find a taker. The Ottawa Senators were quick to offer Gonchar his expected 3 years at $16.5MM deal. 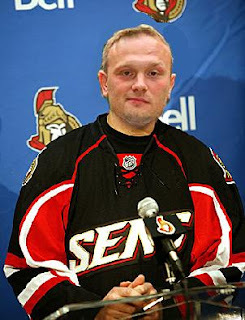 Gonch was dead set on a three year deal and it appeared that he was ready to accept the first offer that came to the table. Part of me things the deal was struck so fast in spite of Shero's stubborn position. All Barry was looking for was for Shero to budge on his two year offer with just one more, but that wasn't the case. As such, our 5 year Penguin veteran, former assistant captain, leader of the defense, quarterback of the powerplay, is now bumpin' uglies with the likes of Chris Neil and Jaarko Ruutu. Good luck Sarge, thanks for the years, thanks for helping us to a Cup. You will be missed. The good news is, old things pass away, but behold, Shero makes all things new. Michalek is a classic stay-at-home defenseman that will provide a solid presence on the blue line. He’s a shot-blocking specialist (led the NHL with 271 blocked shots in 2008-09), and can play a shutdown role against the opposing teams’ top forwards. Like Mike Rupp last season, I think Pens fans will immediately enjoy former Devil Paul Martin. He's a very likeable guy off the ice, and a solid defenseman on it. He's not big (6'1", 200lb. ), and there isn't any one part of his game that's all that outstanding, but overall, he's solid. He played in only 22 games last season after breaking his forearm in a game against, yeah, the Pens. He didn't look quite right after coming back from the injury, but that should be a non-issue this coming season. In his six full seasons with the Devils, he played in 400 NHL games with 26 goals and 137 assists, was a plus-55 and had 114 PIM's. The 37 points (5g-32a) he put up in '05-'06 are his career high in a season. He's solid offensively on the power-play, with 91 of his 163 career points coming on the PP. Defensively, again, he's solid but not spectacular. He's not very physical, registering less than a hit per game over his career. He's not a big shot blocker either, getting in the way of about 1.2 shots per game over his career. As a 3rd/4th, second line defenseman, I think he'll have some very good seasons in Pittsburgh, where the pressure won't be on him to be the guy on the blueline the way it was the last few years in NJ. I even think he'll likely set career highs in goals and points. If he gets significant time on the power-play, he might even have some great offensive seasons. However, I'm not going to lie. I think the 29 year old Martin was overpaid. Of course, if he helps the Pens win games, or is part of a Cup winning team, nobody will care about how much he's getting paid. There you have it folks, the first day of Free Agency. With just about $2MM left under the salary Cap Shero has went public to say he's going to chase after a straggling winger. As he said in his press conference today, re-signing Bill Guerin is not out of the question. But the fact that he mentions it like that simply means Billy is not his first choice. Otherwise Guerin would be a Penguins since he's looking for $2MM a season and that what Shero has. More than likely Teemu Selanne and Maxim Afinogenov might be the two people Shero is waiting on. Today is another day, more free agency happenings will emerge. Stay tuned.